Carer’s Week is just about over. I’m not sure it really started for me. It was just another week. Another week of me struggling to keep my head above water as I fight for proper, timely care and services for my son Brendan Bjorn. The waves continue to crash down on me and my sons, and at times I am not sure I can reach the life buoy. Yes, it is Carer’s Week and it doesn’t mean anything special to me as a full time, lone parent carer…and I find that disappointing on many levels. By noon on the first day of the week, I learned I didn’t get selected for the rental house we applied for because the owner knew another applicant. I also learned that the urgent spinal fusion operation my son desperately needs would be a wait not of 4months, but of 15 months or longer. The day also marked Day 30 of Brendan being on total bedrest due to a pressure sore at the base of his bottom, not allowing him to sit in his wheelchair. That of course also meant Day 30 of me being housebound. (And people wonder why I seem a bit mad?) The day finished up with me having to miss the viewing of another rental home because I only learned the viewing was that very evening, and only for a mere 20 minute timeframe. Another house gone. 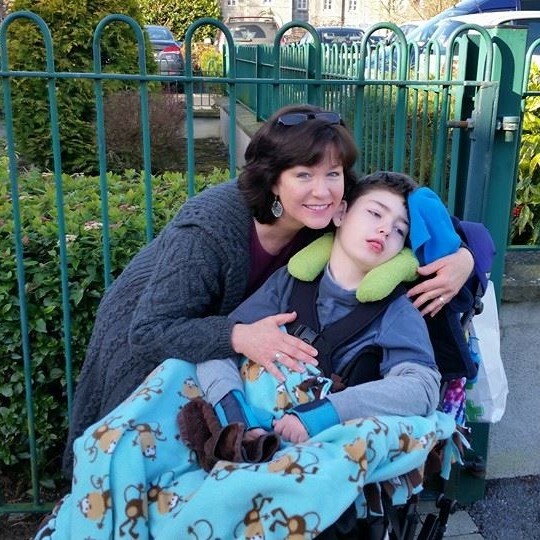 And on yet another house for rent, I was told the owner would not remove the furniture out of the ground floor bedroom so that I could put Brendan’s medical bed and equipment in what would be his room. Strike 3 on the houses. Lastly, more vomiting as his gut won’t accept feeds fully, no doubt complicated by the force of his body crushing down upon his gut with the scoliosis. Feed rate slowed down again in attempts to help. Day 31 of Brendan Bjorn being bedridden and me being housebound. I received a call from the Urology registrar (the one I thought was the consultant until at the end of the appointment when he told me the consultant left 20 minutes before I arrived and he was just the registrar!). The registrar told me the consultant (again, who has never met Brendan) wanted him to be inpatient for 3 or 4 days to teach me how to catheterise Brendan every 4 hours. I was stunned as this is not what we had discussed. I then rang the Paediatric Nurse Liaison, and in tears told her about the call. It turns out that the registrar and consultant didn’t even confer with Brendan’s paediatrician. No, he wasn’t going inpatient. In fact, he’s being referred to a different urologist. The evening ended with more vomiting and again an even slower feeding pump rate. Day 32 of being housebound while Brendan Bjorn is still bedridden. Spending the previous 2 days trying to keep formula down, I once again – for the 3rd day in a row – had to lower the speed at which feeds enter his body. More vomiting and he didn’t even get his daily total due. I rang the scoliosis surgery scheduling office. The referral to be placed on the waitlist hadn’t even been made yet, but sure it’s only been 2 weeks. Ugh! Next task was emailing the Minister for Health, Simon Harris. I have yet to hear a reply, but a number of supportive tweets have been sent his way by other people asking him to reply to me. So, fingers crossed, he will. I won’t be giving up, anyway. Another call to another nurse for supplies. I finished last night, day 3 of Carer’s Week, cleaning up more vomit before going on a Twitter chat about caring. Frustration overload. I’m just off the phone with a TD’s office staff to discuss the scoliosis surgery waitlist. He’s suggested that I email every TD in County Kildare. So, it looks like that will be my task for the day in between caring for Brendan and searching online for a home to rent. Oh, speaking of which, there was one house – a bungalow!! – that came up on Daft today. Problem? It is €1,750 per month and HAP only provides €1,050 per month. I cannot afford the €700 per month difference. So, it looks like another very rare chance to rent a bungalow home suitable for Brendan’s many special needs will go by the wayside. Oh yeah, and it is Day 33 being housebound. Tomorrow will be the end of Carer’s Week. It means nothing to me now. I will take Brendan out of his bed in the afternoon so that we can go look at a rental property I should be able to afford. It is not a bungalow. In fact, his “bedroom” would be the area at the side of the kitchen where the dining room table normally goes. But, if we get it, it will have to make due…because it is better than being homeless. The problem is, no one cares for the carer while they fight to provide the best care possible for their precious loved one. And for my Brendan Bjorn, I will fight like hell.